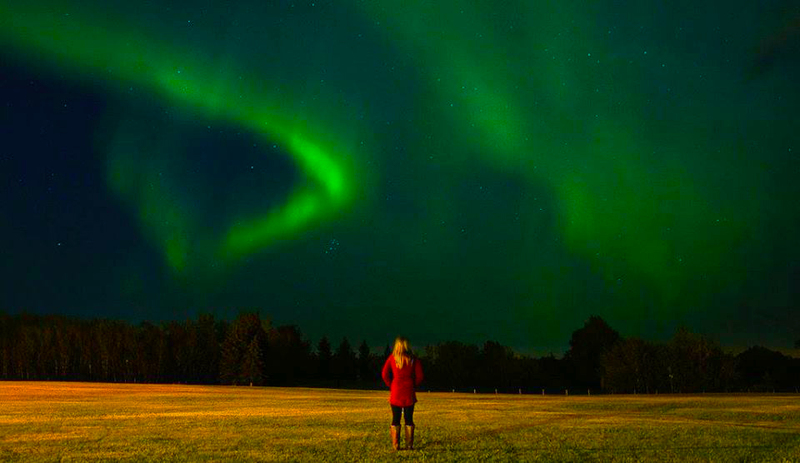 Chasing the aurora borealis became a passion of mine once I returned to Canada from years away travelling. After speaking with people around the world who had never had the opportunity to see the lights, I realized just how special it was to have grown up watching them dozens of times throughout my childhood. 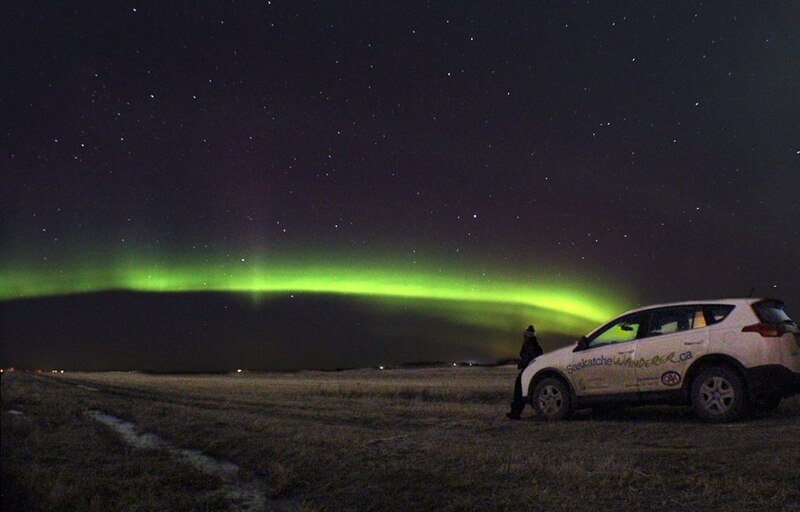 Saskatchewan is perfectly situated to experience some impressive showings of the northern lights. 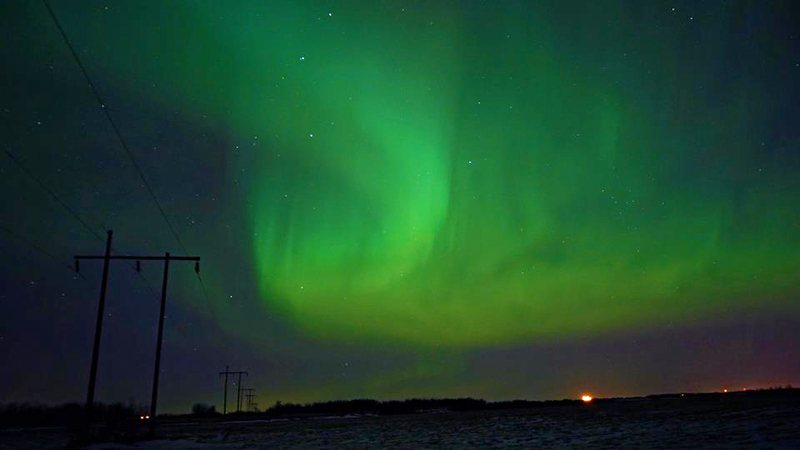 Running from the 49th to the 60th parallel of latitude, there is a high probability to see the lights during a geomagnetic storm. Here are my favourite photos of the northern lights and the often-adventurous stories behind them. The majority of my northern lights photos come from just north of the city I live in. I usually head out with friends. We pile half a dozen blankets and sleeping bags in the car, grab hot chocolate or a bottle of wine, and head out in hopes of watching the lights. I’ve spent the whole night out, often falling asleep in the back of the vehicle. We’ve also killed the car battery and needed a friend to come boost us at three in the morning. No matter what, it’s always an adventure. Like something out of a movie, the northern lights danced, pulsed and swirled across the sky for hours while myself and a friend cozied up in sleeping bags on the sandy shores of Kingsmere Lake. We were hiking the 40 kilometre trek to Grey Owl’s cabin the first weekend of May and lucked out with hot weather and clear skys. 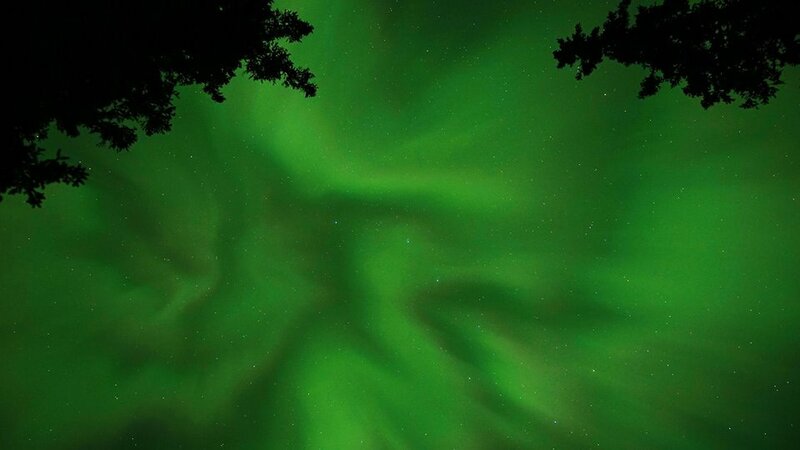 Mesmerized by the psychedelic show, we lied out under the stars in the boreal forest until the wee hours of the morning until it lulled us to sleep. Eventually we had to climb back into the tent to keep the cold off. 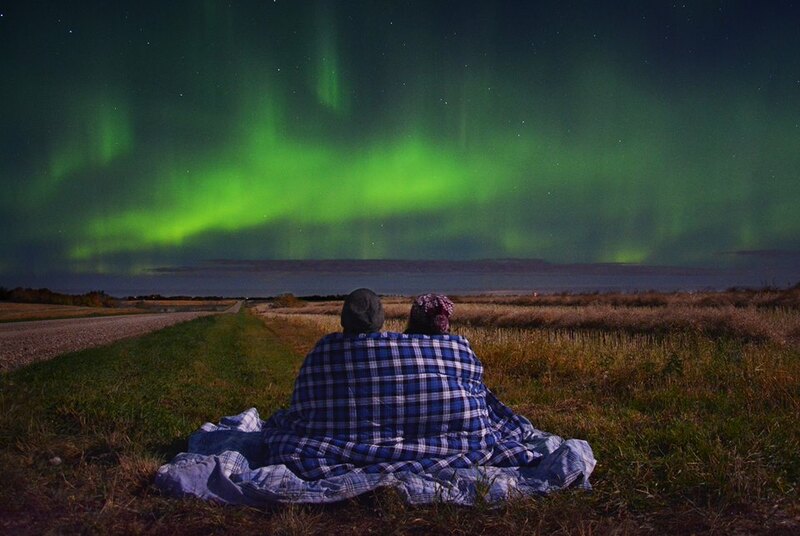 Sometimes it’s hard to leave the comforts of home and escape the city lights to see the aurora borealis. This particular night I gave in to laziness and simply walked out the back door of my apartment building. Living near a golf course, I walked onto the driving range and captured this shot with the glow of city lights illuminating the field. 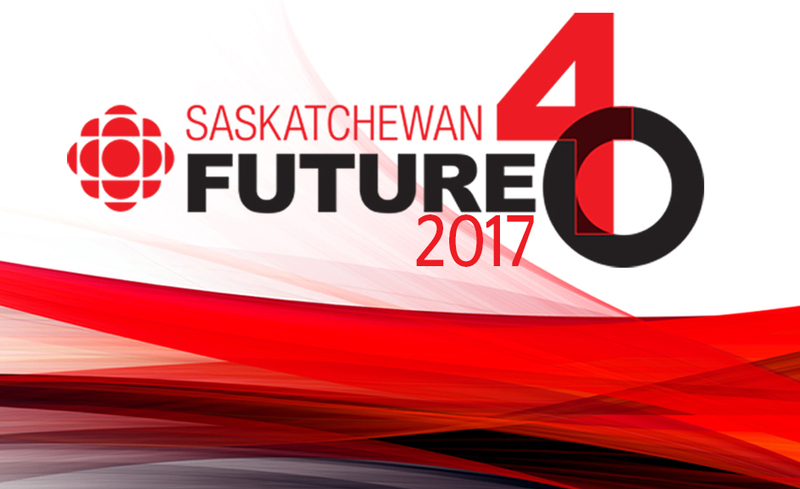 I was hired for an entire year to act as the Government of Saskatchewan’s travel blogger. During that time I travelled more than 35,000 kilometres around the province sharing the best of living, working and playing. I spent a lot of time in my work vehicle and a lot of time discovering locations I never knew about. This night I went out and captured just a little northern lights display. This was near the start of my year and the beginning of a passion for aurora photography. 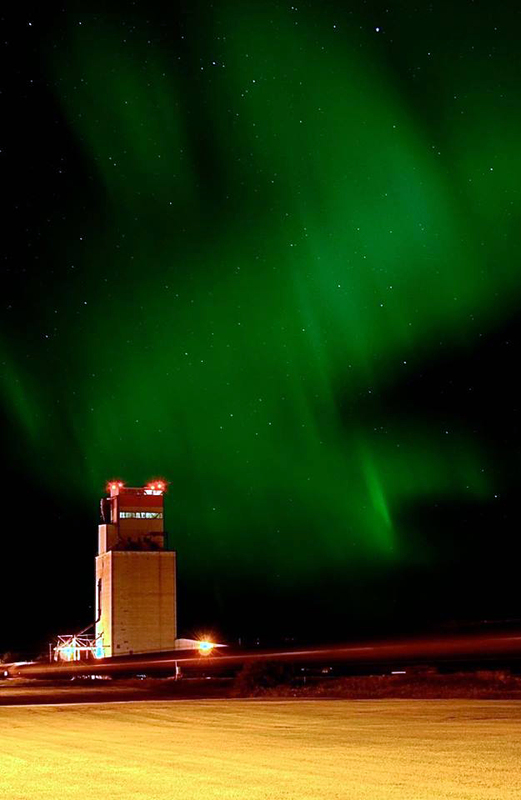 Conveniently in time with the countdown to midnight on New Years Eve 2015, the northern lights exploded across the sky to put on an impressive “fireworks” display. Not a traditional New Years celebration, but a spectacular one nonetheless. The furthest north I’ve ever been in Canada, just shy of the 60th parallel, I witnessed one of the best northern lights shows of my life. 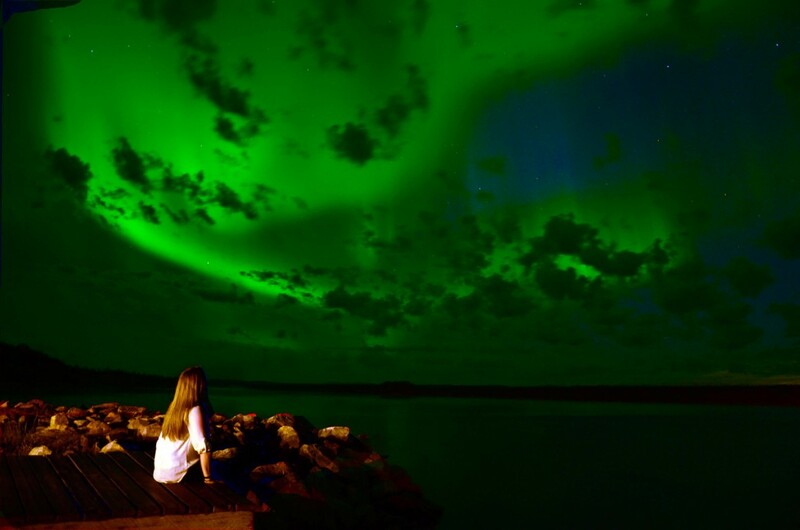 Sitting on the dock in Stony Rapids the sky exploded with a brilliant show of arcing and pulsing green lights. Sharing the moment with a good friend we jumped around in excitement constantly asking one another “are you looking at that? Can you see that? !” The speed and ferocity at which the lights danced across the sky was something I had never seen before. Back at home on my family farm, I spent the entire day running the combine. At night during the last few rounds, my dad hopped in with me. My mom also came out to join us (it was cozy in the two-seated machine). Finishing the field shortly before midnight, the northern lights came out to cheer us on and entertain us. Although the combine’s powerful headlights dimmed them, when we hopped out to head back to the farm truck, the lights were pulsing and dancing overtop of the powerlines. They were still out when we made it back to the farm near 1 a.m. so we stayed out to watch them a little while longer. Heading back to the small town I went to school at, I joined a dozen of my former classmates at our ten year reunion. 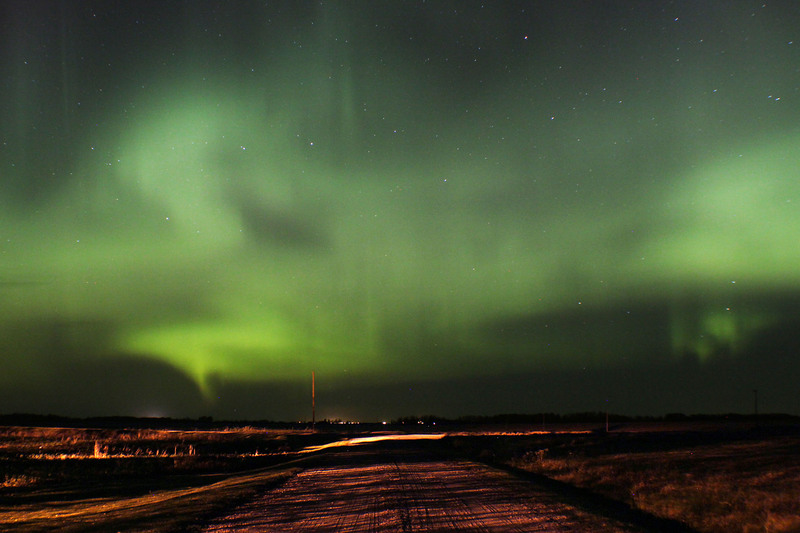 Stopping in town after dropping a friend off at home I was dazzled by the northern lights pulsing across the sky. Thankfully I had my camera and tripod with me and was able to capture the show above the grain elevator as a train rushed past in the dark. A midnight surprise, a friendly beaver swam along the shoreline a little too close for comfort while snapping this photo. Spending a night alone in a yurt along Nesslin Lake, I sat in the sand by the water for almost two hours to capture this shot. Luckily, it timed perfectly with a shooting star.